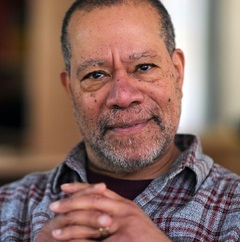 Jerry Pinkney is an award-winning author/illustrator. He won the 2010 Caldecott Medal for The Lion & the Mouse. He has also received five Caldecott Honors, five Coretta Scott King Awards, four New York Times Best Illustrated Awards, four Gold and four Silver medals from the Society of Illustrators, and the Boston Globe–Horn Book Award (John Henry, 1994). In 2000, he was given the Virginia Hamilton Literary award from Kent State University and in 2004 the University of Southern Mississippi Medallion for outstanding contributions in the field of children’s literature. In 2016, he received the Coretta Scott King – Virginia Hamilton Award for lifetime achievement.